I participated in this great blog canival last year and had an absolute blast! You get to meet so many great crafty people via their blogs. It is so fun! This year I am giving away a similar prize to last year. Mixed media crafting stuff. All you have to do to enter is leave a comment. NOTE: Please make sure you either include your email address or that you turn on access to your email address via your blogger profile. If you win and I cannot reach you I will pick another winner. Your giveaway sounds awesome. I'm new to mix media art. Please count me in. Sounds good to me - please count me in! Hope you will stop by my blog. Your giveaway seems to be right up my line. Hello From Ky! Stopping in for a visit from the OWOH Bloggers Event! This is my kind of prize! I love any kind of embellishments. So Many Talented and Creative Bloggers out Here! HI Kim! So nice to meet you! I love this event too! Sounds like I love the same kind of goodies you do! I support all things handmade and beautiful! sounds like tons of cool stuff. Stop by my blog to win a crazy polymer clay face bracelet. It's always great to meet another procrastinator or, as I like to refer to myself, a procrastinatrix. PS I'm signing up to follow. Hey, I'm scrolling to find your mixed media work. Do you have it online?? Your giveaway sounds like a real treat ! Thanks so much for the chance to win. I hope you have a great OWOH adventure ! Hi Kim lovely to meet you. Your blog and love of all this creativity is great. Your giveaway is such an appeal to me with all the work I do. I might get lucky you never know and so might you!! Thanks for visiting. What a great giveaway!A fabulous assortment of things! It is good to stumble upon other people in the region!. Oh my goodness, so much stuff, you are so generous. I would love to win your giveaway. That is quite a collection of fun things for your winner- Bits and bobs are always so much fun to play with - Thanks for the nice opportunity to win your lovely prize. I will certainly put your name in my draw. I hope that you will come and visit again. your comfort dolls are wonderful and what a terrific giveaway! please count me in! This is my first year to be part of OWOH and its fabulous! All these amazing blogs and all these fabulously creative people! I hope you'll stop by my blog (#561). Hello There! Wow, you are so creative AND this is such an amazing and GENEROUS giveaway! I hope to be the lucky person who wins! Your giveaway is beautiful ! please cout me in!!! You surely know how to make every crafter's heart go pitter patter, don't you? ;) Thanks for offering such a great door prize. Hello Kim, It's nice to meet you. Thanks for visiting my blog. You have a fantastic assortment of delicious goodies for your prize. I need all of it! Have a wonderful time with OWOH. Looks SO FUN! I would love to win these supplies to craft with my daughter! I love your creativity. Oh the fun I could have with all your goodies. Hope you have oodles of fun during OWOH. I've enjoyed it so much over the years seeing all of the wonderful blogs and meeting everyone. Thanks for your participation in the event. What an awesome giveaway!! So very generous and fun! It's nice to meet and follow you! come on by and visit with me on my blog! I am #630 on the list! Wow, if I won that, I'd be in Crafter's Heaven! Great blog! Your latest post made me hungry for won tons. LOL! This is a gorgeous giveaway Kim, would love to win! What an amazing prize package, I would love to win! Kim, thanks for dropping by my blog via OWOH and yes our prizes are very similar but we can always use more stuff can't we. Enjoy the hop. cool! what a generous gift! please come enter my giveaway too! what a gorgeous present... i could do with it!Do pop over to my blog at #218. Hello thanks for visiting my blog # 723 for the OWOH event. I would love to win the wonderful giveaway you have put together on your blog, so please put my name in the draw. I'm swooning over your very generous bundle!!! Ooooooooooooh! All those crafting goodies. I'm all of a tizz at the very thought of them!!! What a fun giveaway. Please include me in your drawing. Wow, this is an awsome package, so nice to meet you during this great event! Lovely work and I enjoyed poking around your blog :). What a "delicious" giveaway... I am impressed. YES! this is a wonderful kit-n-caboodle, for sure and certain! Happy OWOH to you! Stop by and visit me if you get the chance; I'm flying along the OWOH journey with you! That's a wonderful selection of goodies! Please enter my name into your draw! And pop over to my blog and enter mine, too, if you haven't done so already! Hello from California. I've really enjoyed visiting your blog. Your giveaway is fabulous! Thank you so much for the chance to enter. Hi I love you doorprize that is wonderful It was nice meeting you today and I hope you can stop by my blog for a visit as well. I would love to win your kit and ka-boodle. Perfect gift for this wonderful event. Thanks so much for the chance. Come on over for a look at my blog number 92. Great prize pack you've gathered!! Thanks for the chance at your doorprize! I would love to win your fantastic giveaway! Oh you have such wonderful goodies!! I really enjoyed reading your blog! What a neat giveaway.As I am in making journals, this is all perfect. Thanks for the chance to win. Please visit me at Irish Muses at #678. Hello from Calgary! It's great to see so many Canadians taking part in OWOH! I like your profile, you and I have many of the same qualities, argumentative, lazy, etc. We'd be good friends. What a great giveaway. Such a large assortment of goodies. wonderful fun goodies, please throw my name in the hat! I really enjoyed visiting your blog. Hello, fellow procrastinator. :~P The door prize is fun--what's not to love about a pile of random creative stuff? Seriously cool. Thanks for playing OWOH with us! I enjoyed your blog and love your giveaway. I hope I winyour lovely kit-and-kaboodle. I see lots of ideas floating around in there. Good wishes to you and happy blogging. Please visit my blog and see my giveaways. Ooooh gorgeous blog candy. Thank you for the chance to win!I love making new friends and your blog is beautiful. You crack me up! You forgot to add that you are brutally honest. I too was an English major but loved literature more than the tech writing. Thanks for stopping by my blog for OWOH :) I hope Peanut heals quickly, but oh what cute cone head pics! Great giveaway on for your OWOH - all the kinds of stuff I use regularly. PS - I love potstickers! Nice :) count me in! Paper and Ribbons, and Fabric Scraps, and lace, and embellishments, OH MY! Hi Kim, someone's going to be very happy to win that lot! I love to sew too! and crocheting, bookbinding, drawing and other stuff.I love cats and chocolate, playing videogames,... even if maybe I'm a little old for that O_O ehehe. Well.. I love your giveaway! all that stuff is perfect to make something cute. Thanks for the chance to win and come to visit me if you haven't already! Hi Kim, I would love to win your papers, ribbons and stuff. I can't have too much of that good stuff. Please visit my blog, too. I am the author of "16 x MOM: A Mastery of Motherhood." I am giving away my book and a couple of laminated 4 leaf clovers. Such a fun and useful giveaway! Thanks for participating in OWOH. Please enter me in the drawing for your awesome ephemera collection. Wow, how generous I could really have a lot of fun with that. Thanks for the chance to win! I really enjoyed visiting your blog this evening. Happy creating. Hi Kim, I love Kit and Kaboodle! Hello from NY. What an amazing giveaway. Thank you for adding my name to your giveaway. Great giveaway! Who couldn't be creative with all of that? Have fun with OWOH! I can NEVER have enough "stuff." Great prizes. Please enter me in your giveaway and visit me, if you haven't already. I'm number 11 and my information is on my profile page. Hi Kim, I would love winning your fabulous lot, as my stash is pathetically slim. Hello from Washington state. I've enjoyed browsing your blog, and what a wonderful giveaway! I hope you come visit me too at #769. Cheers! Hello from Oregon! Thanks for letting me peek around in your blog and enter your giveaway. I covet your stash! LOL. That is an awesome package of instant creativity. I especially love the material (I saw cats on there!) and embellishments. what a wonderful box of joyful ephemera! such fun stuff to play with! please add me to your drawing. Fabulous crafty treasure pack! I can never have enough bits in my stash! Wow, what a stash of crafty goodies! Thanks for the chance to win. I would LOVE to win your blag of stuff! Please enter me into your draw-- thank you so much! Hello Kim! Greetings from Chilliwack, BC, Canada! Thanks for dropping by my blogs during the OWOH 2011 hop! Hope you’ve had a fabulous experience! It’s a pleasure meeting you! Keep your art alive! oh my, you have put together an amazing giveaway! thanks so much for the chance to win! 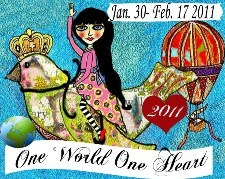 if you haven't yet, i hope you can come and visit me at http://peggyapl.blogspot.com and join my OWOH giveaway. Hi ya'll from east Alabama! What a treasure trove you are offering...and you have a cool blog! Anyway, I'm a jewelry artist of sorts, a watercolor painter, an upcycler, and an over all creative adventurer! Please enter me into the OWOH give away. I hope you can visit my blog, too. I'm giving away a shabby chic denim necklace. Come any time to chat. A lovely pile of goodies to make something wonderful! Thanks for the chance to win and to visit here. When you've time, please visit Thistle Cove Farm. Wow, what a huge pile of goodies! Definitely count me in! That is my kind of kit and kaboodle! :) Count me in for your give-a-way, and I hope you can swing by and visit me as well. Hello and greetings from Virginia. It is so very nice to meet you. I would absolutely love to win the whole "Kit and Kaboodle" you are offering as your door prize. What wonderful items you have included that are perfect to work with... especially in the altered art area. Please throw my name in the hat for a chance to win such a fantastic prize. What a fantastic giveaway! Thank you for a chance to win it! Please count me in your draw.